In a house top right of the Rogue Guild map (cmd_fild07). Talk to him to start the quest. He will tell you about his father. Alternatively, you can talk to any of the 3 brothers (Louis Greg, Thor Greg or Jay Greg) to start the quest. Talking to Thor Greg is the closest to the next step so it is recommended. Inside the Rogue Guild in a secret room. He's hidden inside the Rogue Guild. To find him, go to the lower floor. Go to the room with 4 beds. Go between the two drawers and you will find a hidden passage. It will lead you to the room where Haijara Greg is hiding in. -> I don't mean you any harm! -> I came to help you. He might attack you if you give him the wrong answers. You must start (or restart) the conversation until he tell you to bring a letter to his youngest sond Louis Greg. Inside a locked house lower right of cmd_fild09. To enter the house, the password is: My Father never hoarded upgrade items. Talk to Louis Greg and he will tell you to go find his brother Thor Greg. So go back to Thor Greg (NPC from step 1). Thor Greg will then tell you to find his oldest brother Jay Greg. Inside a hut near the beach lower right of cmd_fild04. To enter the hut, the password is: Antonio doesn't enjoy destroying upgrade items. Talk to Jay Greg and he will ask you to bring a letter back to his father Haijara Greg. 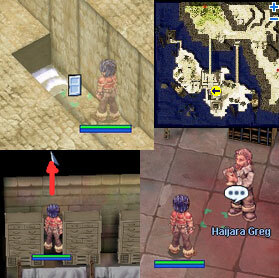 So just go back to the Rogue Guild secret room to talk to Haijara Greg. Next he will tell you to find Thor to learn the skill. When you go and talk to Thor, he will send you the training room for Close Confine. Thor will warp you to the waiting room, join the chat and you will get to the training room. In the training room, you have 5 minutes to complete the training. If you can't get it done in 5 minutes, you will be warped out. Talk to Thor to get back in again if you need to. In the first part of the training, Kienna will randomly appear in the training room. You have to get next to her in 1 second. You will have to do this repeatedly until you get close to her to start the next part. Once you are next to Kienna, the second part of the test begins. Now, you have to predict which way she will move and block her from the left, right or rear. You have 10 tries and you must at least guess 6 of them correct in order to pass. Keep trying until you get enough score to pass. After the test you will be warped back to Thor. Talk to him to confirm you have passed the test. He will tell you to find his father so he can teach you the skill. Now go back to the Rogue Guild's to talk to Haijara Greg again. In the same room as Haijara Greg. Talk to Haijara Greg and he'll say someone steals his book. Talk to him again and Killer will appear in the room. Now, it's going to be similar to the training you previously had with Kienna. Get next to Killer and predict his movement to left, right or rear. Follow the instruction Haijara Greg tells you. When you are successful, talk to Haijara Greg to return him the book. Finally, he will give you the Close Confine skill.